This entry was posted on August 31, 2014 at 7:47 pm and is filed under 1980s, Heavy Metal, Heavy Metal and the 1980s, Music, Rock, Uncategorized with tags all female bands, Beauty and the Beat, British, Classic Rock, Girlschool, hard rock, Heavy Metal, Heavy Rock, Hit and Run, The 1980s, The Go Go's, ZZ Top. You can follow any responses to this entry through the RSS 2.0 feed. You can leave a response, or trackback from your own site. I’m intrigued by these guys. I must pick up that boxset of early albums sometime soon. I’ve only ever heard them on the Motorhead bonus tracks. Nice one. 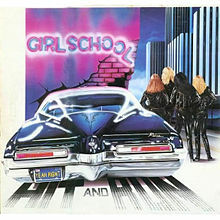 I F-king love Girlschool. My uncle saw them in their prime a few times (met them too) and said they were amongst the best metal gigs he ever saw. This is a damn fine LP too. 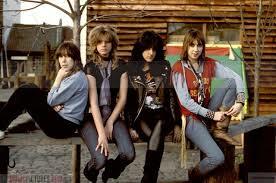 Thanks and I’m dead jealous that your uncle met Girlschool. I loved both their gigs when I saw them.